Click here for BREEZE Schedules, which include the following Carlsbad routes 322, 323, 324, 325, 344, 422. 422, 444, 445 . Privately operated shuttle buses connecting Carlsbad shopping centers, hotels, Coaster stations, Legoland and Oceanside Transit Center. 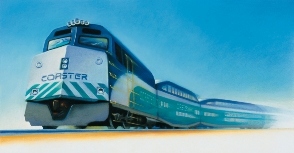 Coaster commuter train – (800) COASTER. Coaster web page.